So I’ve gotten a few days behind in my posting of Project 365 so I decided that since it’s Tuesday I would do a Two-fer Tuesday special and combine two days into one post. It’s your lucky day!! Two photos in one post!! OK, you probably are not as excited as you should be so let’s jump into the details. The first photo is of a fruit salad that my wife out together. 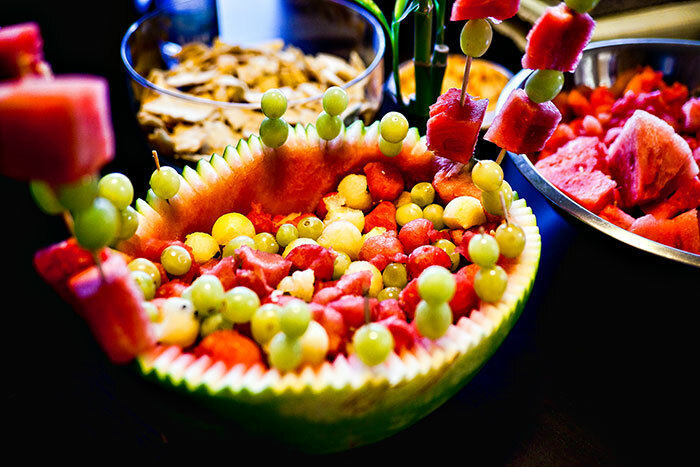 First she carved out a watermelon rind by scooping out the watermelon in little balls. There are actually two different kinds of watermelon, a red one and a yellow one. The yellow is my favorite and is so ultra sweet. She also added in green grapes and pineapple. This was our addition to my nephew Brenten’s birthday party. He just turned 15. Another year and he will be driving and the sidewalks will no longer be safe. Yesterday I attended my company picnic. We all cut out of work a few hours early and took the families down to a local park where the kids got to play on the playground while the adults chatted and BBQ’d hot dogs. Since I always have my camera with me I started taking some photos of the event. I think sometimes when I shoot photos I get lost in the bigger picture and forget the often smaller pictures that are just under foot. In this case I spotted these leaves that were partially buried in the sand of the playground. 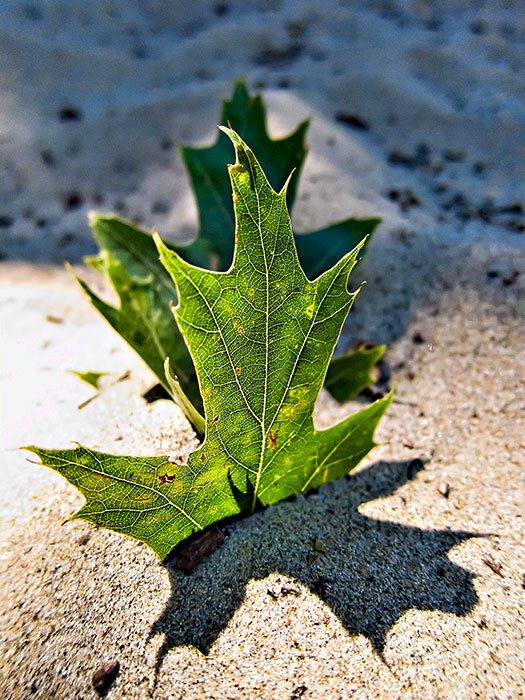 I thought that they really made an interesting photo as the light glowed through the leaf and cast a dark shadow on the gritty sand. It’s so easy to lose sight on the minuscule world all around us. Sure we all love a good landscape, the breathtaking views and the glowing sunsets but let’s not forget or lose sight of the world right around us. A bottle cap on a deck (taken by a friend of mine), peaches on a step (another Flickr contact) or two leaves half buried in sand. The photographers eye leaves no sight unseen and no photo untaken. Thanks Mark! Send me an email with what images you would like to use and I can size them as needed. Always good to hear from you.